Looking for an audio book the whole family can listen to? Try Ungifted by Gordon Korman, where we meet Donovan Curtis, aka Donny. Donny is a middle schooler who has lots going on his life. He frequently gets in trouble for the poor choices he makes, usually with his two best buds, the Daniels. Donny’s home life has become very strange as well. His very pregnant sister has moved back home while her husband is serving as a tank commander in Afghanistan. She has brought with her his brother-in-law’s dog, a Chow-Chow named Beatrice, who hates everybody but Donny. Donny’s life becomes more complicated when he impulsively smacks a statue at school, causing the globe Atlas is holding on his shoulder to be dislodged. Once loose, the globe races down through the parking lot ultimately crashing through the gym doors into a basketball game being watched by the Superintendent of Schools. Donny is caught almost red-handed. In a bizarre twist of fate, Donny ends up as a student at the gifted school. He is not sure how this happened, but he’s counting his lucky stars that he escaped punishment for the Atlas incident. However, Donny does not belong with the gifted kids. He knows it, his classmates know it, and even the teachers know it. What Donny lacks in school smarts, he makes up for by helping his new classmates be more “normal.” Well, that, and helping with the robotics project. The gifted students are trying to beat their archrivals for the state championship. Ungifted is a story about finding your place wherever you land. It also explores the gifts of friendship and what it really means to be accepted for who you are. Though I haven’t reviewed a lot of books for the blog this year, I certainly have read many! Although I read a broad variety of fiction, I tend to gravitate toward suspense and mystery titles, as well as any book that pays a lot of attention to the narrator’s thoughts and “inner life.” I also enjoy reading nonfiction, especially memoirs and focused history. My favorite “new to me” books of 2013 definitely reflect these reading preferences, and here they are in no particular order! One morning, recently-retired Harold Fry is surprised by a letter from a friend he hasn’t heard from in more than twenty years. Queenie Hennessey, an old colleague, is in hospice care in Berwick-upon-Tweed – about as far from Harold’s town of Kingsbridge as you can get. Touched by Queenie’s letter, Harold pens a reply and, donning a light anorak and his leather yachting shoes, sets off for the mailbox. He passes two, then three mailboxes… and as he walks farther and farther from home and his wife Maureen, Harold wonders why he doesn’t just go to Berwick-upon-Tweed and deliver his letter to Queenie personally. By the end of the day, Harold has convinced himself that as long as he keeps walking north to his old friend, she will survive her illness. Joyce writes a sparse, allegorical narrative that is told almost entirely within the confines of Harold’s mind. I listened to the audiobook on a six-hour road trip. Jim Broadbent’s narration is top-notch, and the story itself is perfectly suited to a long drive. I’m a sucker for a good detective series, and had been meaning to give Louise Penny’s Agatha Award-winning Armand Gamache series a try for a couple of years. Three Pines is a sleepy town outside Montreal, unremarkable to all but those who inhabit it. The police force doesn’t have much to do… until early one morning, the elderly but spry Jane Neal is found dead on a quiet path where she usually walks her dog. Although it first seems that a hunting accident was the cause of her death, but the more Gamache and his team investigate, the less things add up. The book is atmospheric with a flavor that is both autumnal and decidedly Quebecois, making it an excellent companion to a hot beverage and a warm blanket! Pots, pans, stoves, and ovens might seem like the most basic of kitchen equipment to us. But after reading this history of kitchen technology, you’ll marvel at the ingenuity of the people who figured out that by putting something between food and flame, and by containing the heat, we can improve flavor and get different resulting textures. This book is full of moments where the reader is invited to think about the origins of everyday kitchen objects that have shaped the way we cook, the way our homes are structured, and ultimately, how we live our lives. For foodies, technology junkies, and history buffs alike, this is a must-read that’s divided into manageable chunks. This is a classic in the suspense genre that somehow, I hadn’t gotten around to reading until this year. It was well worth the wait! The unnamed heroine has just married Maxim de Winter, a wealthy and kind widower with whom she is deeply in love. Everything seems perfectly ordinary until she moves into Manderley and meets Mrs. Danvers, the rather sinister housekeeper who seems to spend the majority of her time ensuring that everything in the house is exactly as it was on the day Rebecca – Maxim’s first wife – died. It’s not difficult to see why Alfred Hitchcock chose this book as one of his first film adaptations. The book’s slow start and emotional climax are hallmarks of Hitchcock’s work and help add to the inherent creepiness of the story! As a young adult novel set in a Middle Ages without magic, dwarves, witches or unicorns, Mimus is unique from the start! In a peace negotiation gone wrong, King Philip is kidnapped by a rival kingdom’s army, and later so is Philip’s son Prince Florin. In a cruel act of humiliation, the enemy ruler assigns Florin to be a fool, studying under the court jester Mimus. If Florin doesn’t perform the songs, jokes, and impressions his mentor writes, it will mean torture and punishment for him and his father – but every song mocks his father and every joke has his homeland as the punchline. Can Florin let his guard down long enough to learn who Mimus really is – and how he can save his home kingdom? Packed with philosophical conversations between Florin and Mimus, along with several action sequences, this book will appeal to adult fans of historical fiction as well as teenaged ones. If you watched the CBS TV series of the same name this summer (filmed in the Wilmington, NC area), you may think you already know what happens in the book. Trust me, you don’t. Although Stephen King is a producer on the series, quite a lot was changed from the book. Characters were deleted or changed to varying degrees, plot elements were similarly altered, and the strong rumor is (this review was written before the end of the TV season) that the conclusion and the answer to where the dome came from will also be different from the book. What is the same? The small town of Chester’s Mill, Maine is suddenly and completely sealed off from the rest of the world by an invisible dome and the residents slowly run out of food, fuel, medicine, patience, and in some cases, sanity. I don’t really “do” Horror, and while I love Stephen King’s writing, I tend to stay with his more Fantasy and Sci-Fi type novels than his Horror (see my reviews for The Gunslinger and 11/22/63). While there are a few scary moments and some pretty gruesome bits in the book version of Under the Dome, I would classify it mostly as a Suspense / Psychological Thriller novel. Another difference between the book and the show is that there is a much larger cast of characters in the book, although (minor spoiler) quite a few do not survive until the end. It’s almost as if George R.R. Martin (of Game of Thrones fame) wrote a small town sci-fi suspense thriller. In addition to many more characters, there are naturally many more events, twists, turns, red herrings, and dead end leads in the novel as Dale “Barbie” Barbara, Julia Shumway and others go up against “Big Jim” Rennie and try to figure out where the dome came from, how to survive inside it, and if there’s anything they can do to make it go away. Of course, to make a TV series or movie based on a book, much has to be edited out and the pace generally has to be picked up, and in the case of TV, the story arcs need to happen episodically. I generally liked the TV series, despite how much is different, but I really enjoyed listening to the audiobook version of the novel. Raul Esparza does a fabulous job embodying the characters of Chester’s Mill, Maine, as the pressure is slowly turned up on those trapped inside this invisible and apparently indestructible dome. One other amusing note about the series: Maine is certainly not known for streets lined with Southern Live Oaks or for having smooth, sandy beaches, although that is what we see on TV. But, don’t let that minor detail detract from your enjoyment of the show, or better yet listen to or read the book instead. Bill Bryson writes two kinds of books: humorous travel essays (A Walk in the Woods) and serious books about history and language (A Short History of Nearly Everything). This memoir doesn’t fit into either category, although it comes closest to the former, only the “place” we are traveling is Bryson’s 1950s childhood. I was recently looking for a good audio book and was pleased to find a Bill Bryson book I hadn’t read yet. The author narrates his memoirs and he does a wonderful job evoking the voices of teachers, relatives, and other adults he encountered growing up, as well as himself as a child, and his young friends. Bryson was born in the middle of the Twentieth Century (1951), in the middle of the United States (Des Moines). He uses his unique world view and wit to shine a nostalgic light on what most people would call a simpler time. Bryson doesn’t view the past through rose-colored glasses however, he recalls both the good, and the bad from this time, although “the bad” mostly refers to getting in trouble (accidentally setting his friend’s house on fire – twice), under-performing in school (he had more absences than a kid with a chronic disease), and the annoying things his parents did (his dad didn’t wear underpants at night and his mom couldn’t cook). I often found myself laughing out loud in the car while on my daily commute and hope my fellow drivers didn’t think me too odd. In addition to Bryson’s wonderful childhood reminiscences, he also includes brief historical background about life in the ’50s for almost every chapter. There’s a brief section about the Cuban Missile Crisis accompanying the story of the time young Billy got his teacher in trouble because he refused to duck and cover during a drill (because no one ever checked to see if you actually did it). He provides interesting facts and statistics about the growth of per capita household income and the explosion of labor saving devices during the ’50s as he discusses the time his parents got a new refrigerator and showed it off to neighbors and visitors for the next six months. He discusses the times spent as his grandparents’ farm for family gatherings and also lets us know just how much farming and farm land has decreased in America over the past half century. He laments the loss of the individuality of different towns & cities, which is something that those born in the ’60s & even ’70s can relate to. Bryson’s funny stories and entertaining anecdotes are too numerous to mention, so if you’re looking for a good read this summer, I hope you’ll give The Thunderbolt Kid a try. Again, the audio version is excellent, although the print version has lots of photographs from the 1950s. One small warning: there is adult language in this memoir of childhood, but I think it is used sparingly and to great comic effect. You never know what goes on behind closed doors, what family dynamics exist that push people to do what they do. In this small town where everyone knows everyone, two families awake to find their little girls missing, seven-year-old Calli Clark who has not uttered a word since she was a toddler and her best friend Petra. Gone since early morning, the only clues are their small foot prints and what appears to be drag marks. Calli’s mother struggles with the knowledge that it appears she might have been taken into the woods by her father, Griff, a pipeline worker who is gone most of the time and who can be abusive especially when he drinks. Griff is supposedly out fishing with a buddy but when nobody can find him, he becomes the prime suspect. Neighbors are set against neighbors, bringing divisive issues that were thought to be put to rest, to the forefront. Calli’s mother is forced to deal with her relationship with Griff once again as they search for their daughter. Put aside some time to read this book because you will want to read it from cover to cover to find out what happens to the girls, who took them and why Calli refuses to speak. The action cuts back and forth between their odyssey through the woods and the town’s search for them. Gudenkauf does a good job of keeping secrets right up to the last chapter. You’ll never guess the ending! I stumbled across Hampton Sides while looking for a new audiobook. This is one of the best audiobooks I’ve ever listened to. He writes nonfiction in the most vivid, engaging style that makes this a page turner of a book, as good as the best novel with plenty of suspense. This is the story of the hunt for Martin Luther King’s killer. The name James Earl Ray never comes up because Ray used many different aliases. Sides painstakingly depicts Ray as a habitual petty criminal and extreme racist from a family of the same kind whose motivation appeared to be to commit the perfect crime and prove to himself that he was a master of the game. Ray seemed to think that he could outsmart all the people who were looking for him. The manhunt began immediately based on where the witnesses said the shot came from. There is a famous photo showing the men pointing toward the rooming house from which Ray fired the fatal shot. All of King’s associates, J. Edgar Hoover, the other FBI agents, family and others are part of the story. Suspense mounts as Ray stays just ahead of efforts to apprehend him. Just as he was about to sail from England to Africa on a forged passport, he was captured and the brought to justice. It was a supreme achievement for the many law enforcement agencies that were on the hunt for him. Ray eventually confessed, was sentenced to prison, managed to escape and was recaptured. He attempted to recant his original confession in order to gain a trial, but was not successful. Even if you have read the newspaper accounts, there is so much more to be learned from this book. I highly recommend it. 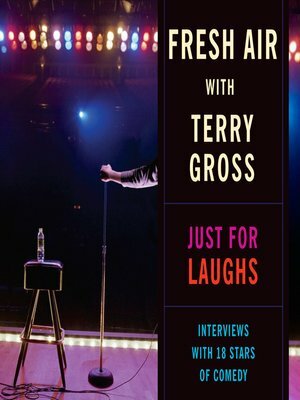 Fresh air with Terry Gross Just for Laughs : interviews with 18 stars of comedy. I really enjoy learning about the art of comedy. It has always been an admirable skill to make someone laugh especially when life is not so funny. When I found this audio download available through my library, I was very happy. This 3-hour audio contains 10-15 minute snippets of past Fresh Air interviews. There is a nice variety of comedians old and new, working in a variety of genres, giving the listener a wide variety of experiences. The compilation includes the following interviewees: Aziz Ansari, Mike Judge, Trey Parker & Matt Stone, Sarah Silverman, Will Ferrell, Denis Leary, Sacha Baron Cohen, Stephen Colbert, Mort Sahl, George Carlin, Don Rickles, Tina Fey, Tracy Morgan, Joan Rivers, Steve Martin, Billy West and Woody Allen. Terry Gross, recipient of the 2003 Edward R. Murrow award, is a fantastic interviewer. The interviews are a very casual experience. I never get the impression that she crams for the interview but draws from her own knowledge as a fan and asks questions that are important and interesting to the listener. She is completely engaging and most importantly, not afraid to laugh. Although there are many laughs, there are also things to ponder. I love to hear about all the work that goes into being a seemingly effortlessly funny and successful comedian in a chosen genre. Much of what makes people laugh can be controversial. This discussion of controversy was most intriguing and thought provoking. Comedy to me is very raw and sometimes not pretty whether the comedian is taking from his/her own life experiences or holding a mirror up to society. Also, it is interesting to see comedians out of their element. Guess what? They are people just like you and me. They are not always a laugh-riot which is even more proof that comedy is an art requiring hard work. So if you need a laugh AND like to think, check out this downloable audio book. When H arry Potter and the Sorcerer’s Stone, the first novel of the famous Harry Potter series, became wildly popular, I wondered what all the fuss was about. Not usually one to hop on the popular bandwagon, I was skeptical at first, but J. K. Rowling grabbed me from the first paragraph. I avidly followed the fortunes of “The Boy Who Lived” as the series stretched into seven novels. My daughter and I were so thrilled when each new book came out that we had to get two copies, one for each of us; otherwise, we would sneak into the other’s room in the middle of the night and steal it off the bedside table! Fortunately for us, as the series came to its breathtaking conclusion, we discovered the audio version narrated by Jim Dale. Now we could not only enjoy rereading the Harry Potter books, but also hear them read aloud to us on audio. These fast-paced novels—full of brilliantly envisioned characters, and packed with suspense, pathos, and humor—are a treat to listen to, especially as narrated by Jim Dale. He has a perfect voice and delivery for this story. His smooth British accent is clear and easy to understand, with just enough of a clipped, wry expressiveness to it so that you appreciate Rowling’s humor. These days, whenever I reread a Harry Potter book I hear Jim Dale in my head, because he has done such a good job portraying the characters exactly the way they are described in the books. My ten-year-old son has become as big a fan as the rest of us, so he and I listen to Harry Potter books while we do chores around the house. Our family loves to listen to the series while we are stuck in the car on long trips. How many times have we listened to the whole series? I’ve lost count. The satisfying complexity of the story means that we are always figuring out new connections and discussing new insights. You can get all seven of the Harry Potter books, narrated by Jim Dale, as audio books and also as downloadable audio, so you can listen to it on your home computer or portable device. When you check out Harry Potter and the Sorcerer’s Stone, be sure you put the rest of the series on hold. You’ll definitely want to hear them all! Today’s blog talks about five audio books I’ve enjoyed during 2012. I listen to fiction and memoirs, and if read by the author, all the better. Each year, I stumble onto a children’s book title and find juvenile fiction altogether as engaging as adult fiction, so one is included here. — Lynn W.
Carol presents a series of short vignettes from her private and performing life. Some feature her grandmother, Nanny, a real character, who loved show business and the contacts she made through Carol and capitalized on them. There are funny stories, like how her adoration of Jimmy Stewart panned out the first time they met on a set when she got her foot stuck in a pail of whitewash and walked out with it still attached, too tongue-tied to say a word. The author reads this collection, adding to the emotional depth and also the comic moments. If ever there was a mismatch, it was Ree and Marlboro Man. Ree, a native Oklahoman, went to southern California for college and never looked back towards Tulsa except for holidays. Now in her mid-twenties, home is a pit stop on her way to the big time in Chicago. While there she hits a bar with friends and meets Marlboro Man, a tall, strong, real-life cowboy. Their story, read by the author in her authentic and charming Oklahoma voice, is a true love story. We never learn Marlboro Man’s name, but we sure feel the heat develop between them. This eighth Isabel Dalhousie mystery set in Edinburgh, Scotland pleases the ear with soft Scottish accents and descriptions of the gray city and green countryside. Isabel Dalhousie, a philosopher, is approached by a visiting Australian philosopher seeking her biological father’s identity. This is the “mystery.” Isabel and her fiancé Jamie are planning their wedding, all the while watching their beautiful son grow from day to day. This series is a leisurely walk through Scotland’s capital, meeting along the way fascinating people and places and everyday concerns. Two teenage boys in 1960s small town North Carolina form a friendship over their love of jazz, a relationship not exactly accepted in this segregated community. Dwayne absolutely loves James Brown’s Live at the Apollo album, while Larry Lime is a pianist wanting to learn Thelonious Monk’s style from a jazz musician called the Bleeder. Their story and shenanigans will entertain while showing music is truly one of the ways humans unite and move beyond their differences. This audio is well-read, giving voice to accents and origins with accuracy. If your parents disappeared one stormy night and your fishing village neighbors were forced to take you in, how would you feel? Especially if almost everyone is sure your parents were drowned at sea and you are absolutely certain they are merely delayed returning? Primrose Squarp tells her own story; her twelve-year-old point of view of friends (does she have any left?) and neighbors (including Miss Perfidy, who is paid by the town to care for Primrose) is fresh and rings true. Over the months, Primrose rediscovers her uncle, goes into foster care, and begins work on a cookbook while she awaits her parents’ return. This is a delightful mood lifter.